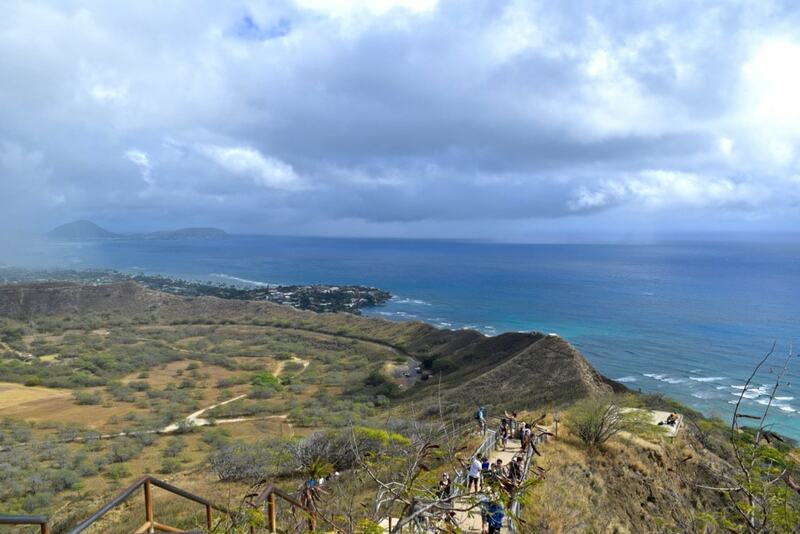 The Diamond Head hike in Oahu, Hawaii offers some of the best views of Honolulu along with a chance to check out an incredible ancient crater! It was my first day in Hawaii. 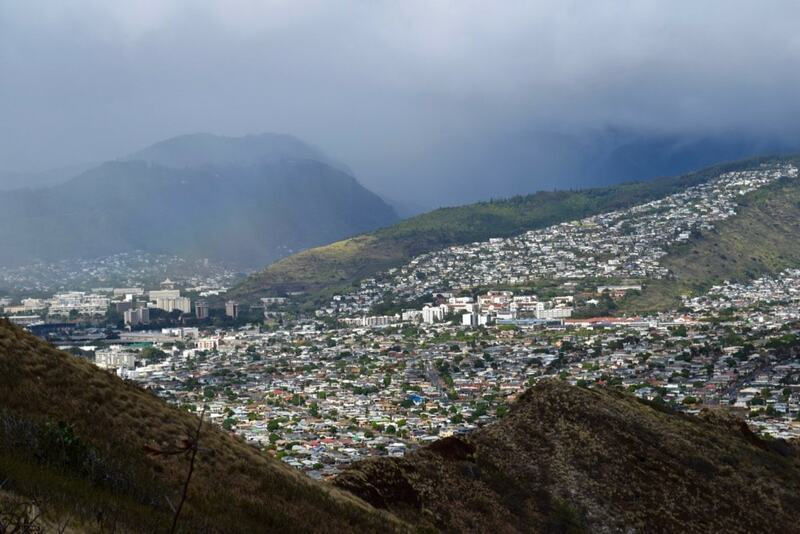 I’d arrived in Honolulu the night before after a 20+ hour journey from the UK. 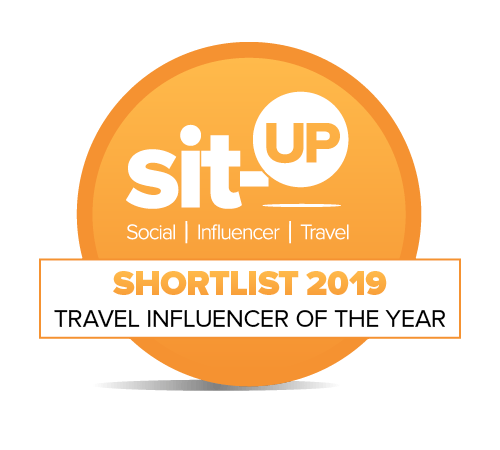 I was lapping up the winter sun while wandering around in a haze of jet lag. I was dying to explore but my body was pretty wiped out. With hindsight, I probably wasn’t in the best state for a long hike… but let’s forget that part! 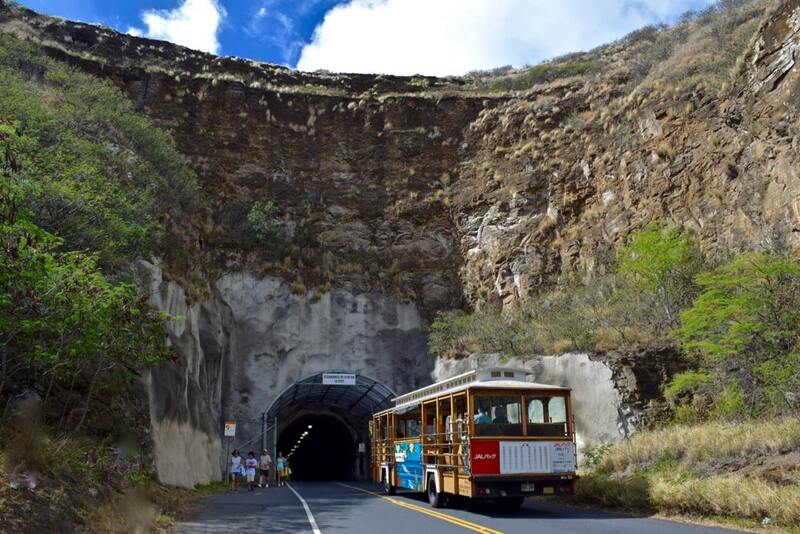 One of my new travel buddies had asked a few locals for tips on where to go, and Diamond Head had been mentioned several times. 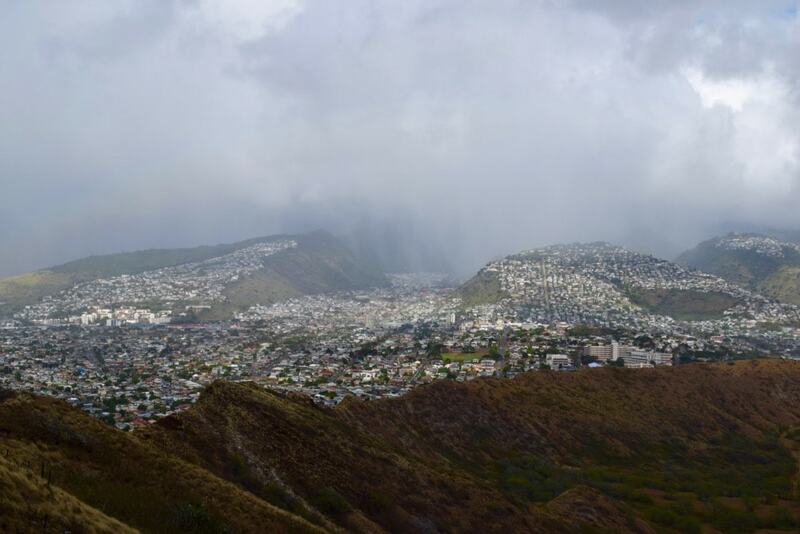 From our current location overlooking the white sands of Waikiki Beach, we were told we could walk to the trailhead. 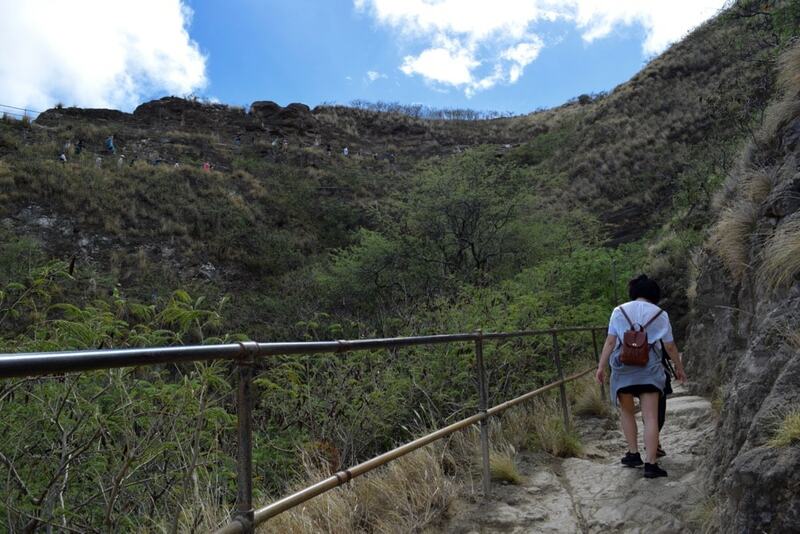 Eventually we made it to the trail entrance via a tunnel, and looking around, realised we were right in the middle of the crater. It was pretty incredible! Steep grass-covered mountains surrounded us and we knew that although we’d been walking for well over an hour, the real hike was only just beginning. 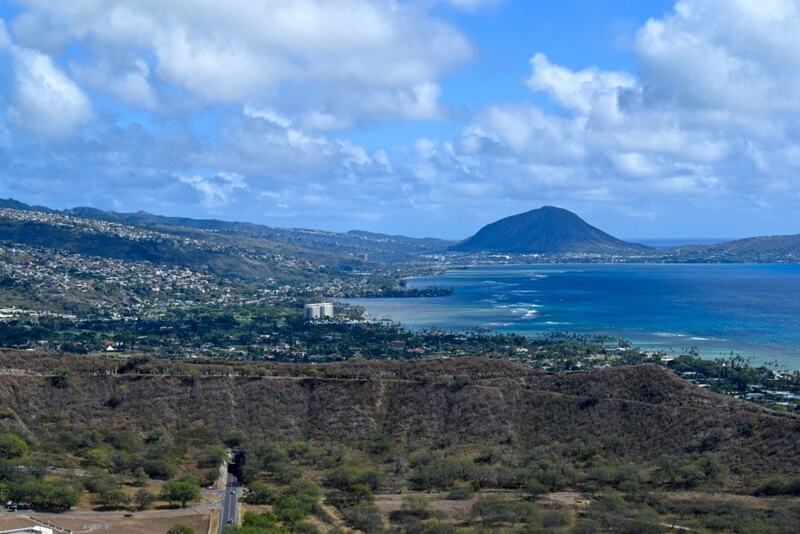 What is Diamond Head In Hawaii? The saucer-shaped crater was formed round 300,000 years ago. 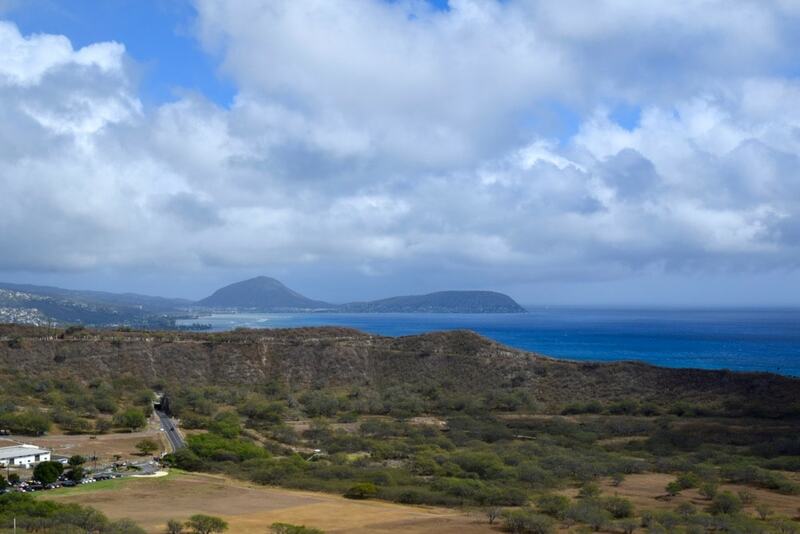 In the 1800’s, British sailors saw the glittering stones towards the top of the crater, and soon enough it had the name Diamond Head. 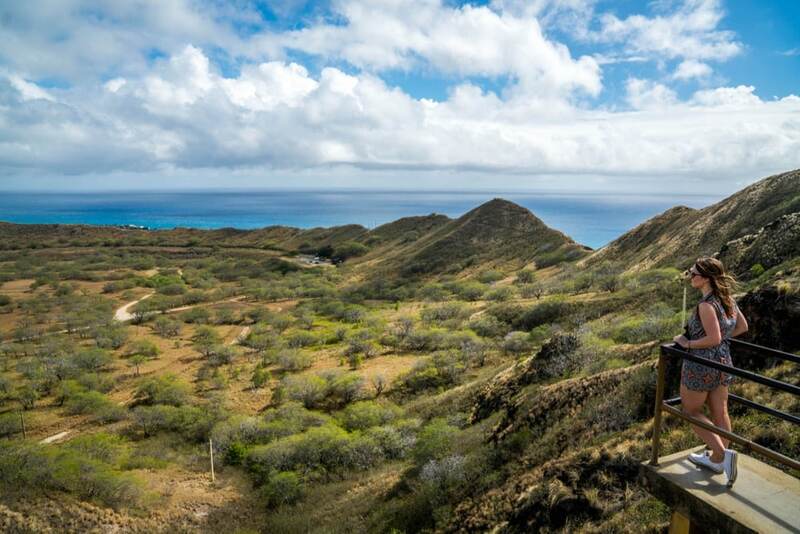 The US Army built the trail at the start of the 20th Century, and as you head up to the summit you’ll catch a glimpse of its military history. 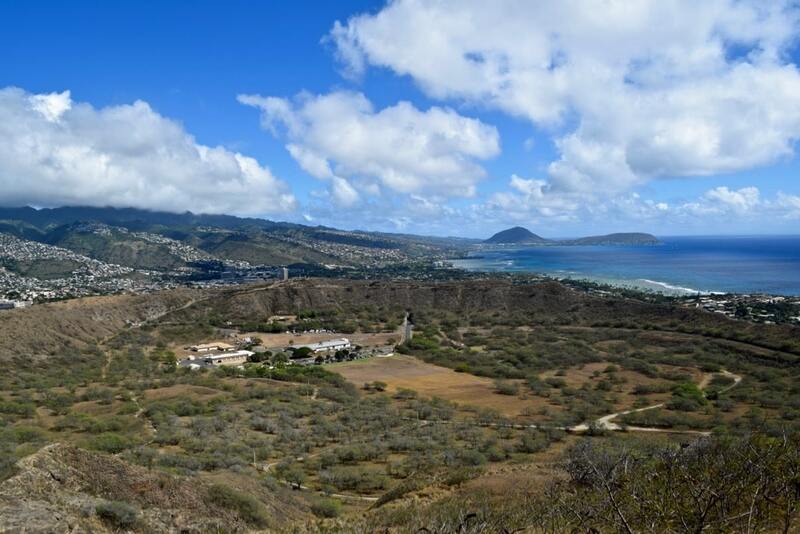 With panoramic views from Koko Head to Wai‘anae, the summit of Diamond Head was an ideal site for the coastal defence of Oahu. 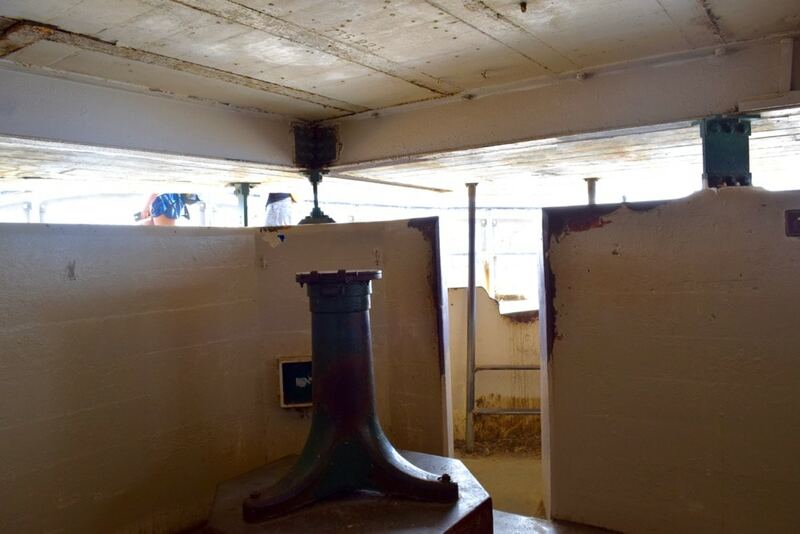 Batteries were built to house the coastal artillery and guns were placed ready to defend. 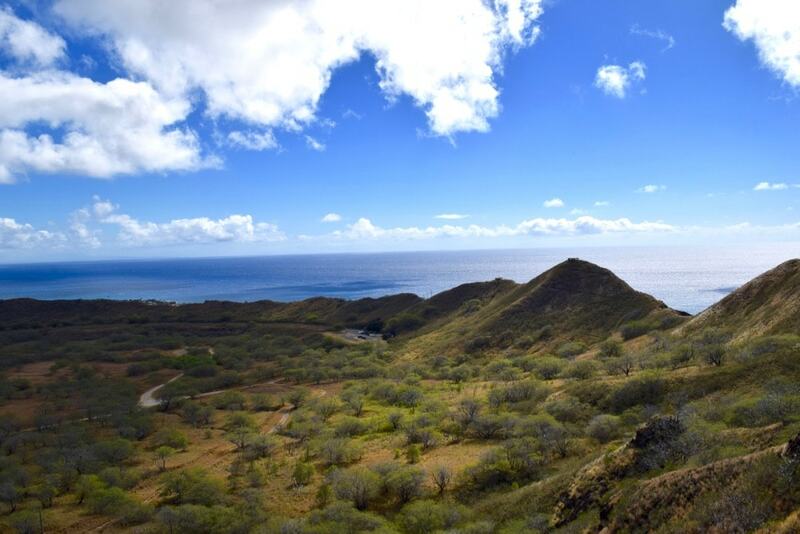 The trail is under a mile in length but is strenuous for many due to the steep gradient – in fact you’ll hike to a height of 560 ft to reach the summit. 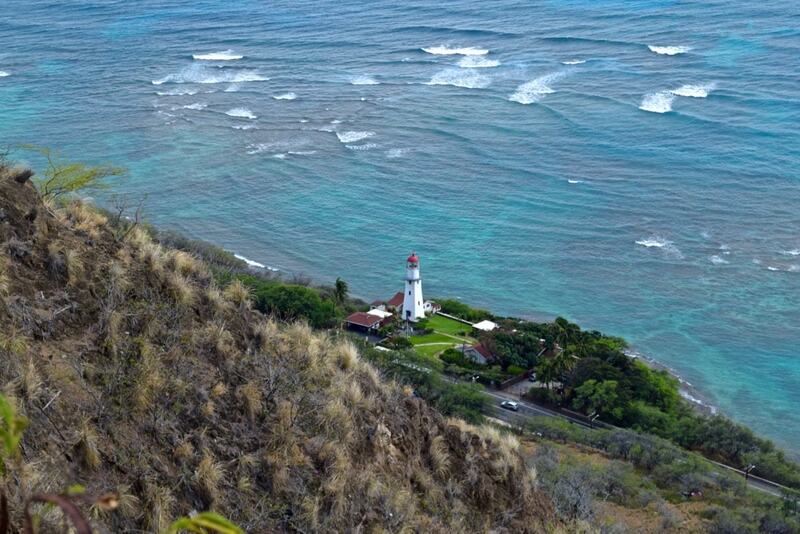 What’s The Diamond Head Hike Really Like? 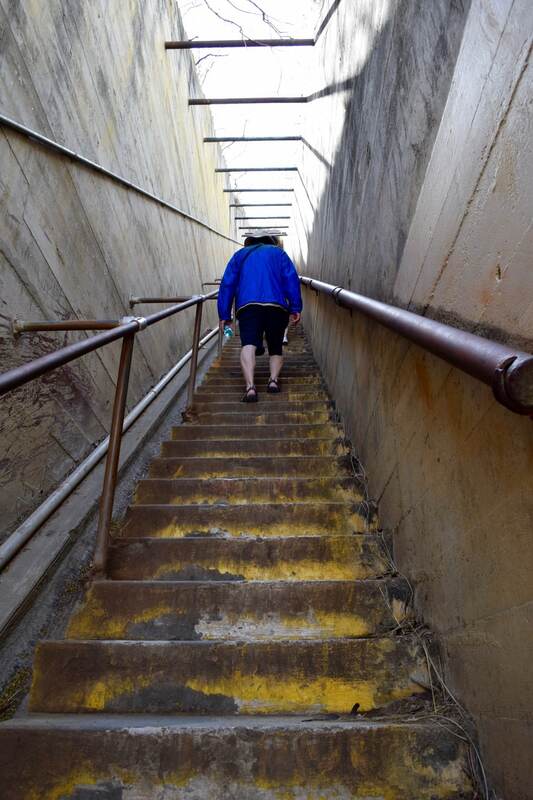 The Diamond Head trail is an interesting one. At the start it’s not too steep, and the ground is easy to walk on. 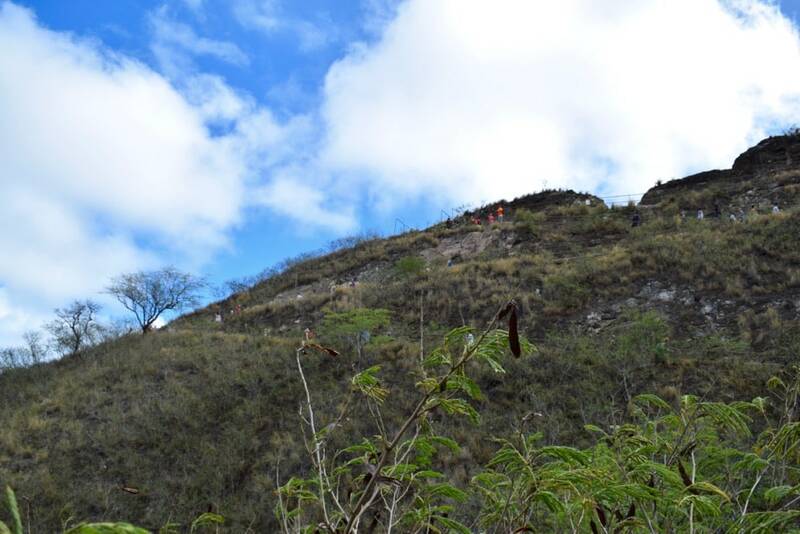 Gradually it becomes not only steeper, but also the ground rougher with lots of loose stones. It’s also slippery in places. 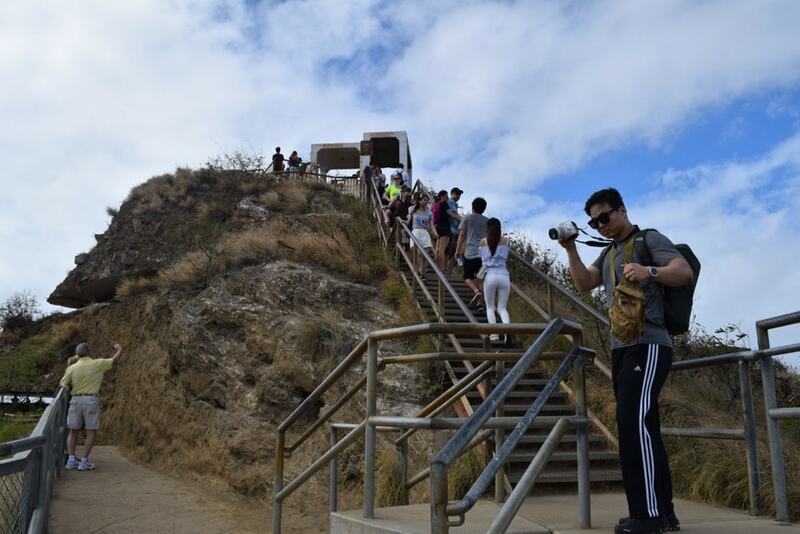 There are a few sections with incredibly steep stairs, one of which is very narrow. There’s a wonderful lookout around half way, with a couple of viewpoints that lean right out over the incredible terrain. There’s a tunnel, which has no lighting! It was pitch black and eerie but we used our phone torches to guide the way. There’s also a spiral staircase through the old Fire House. 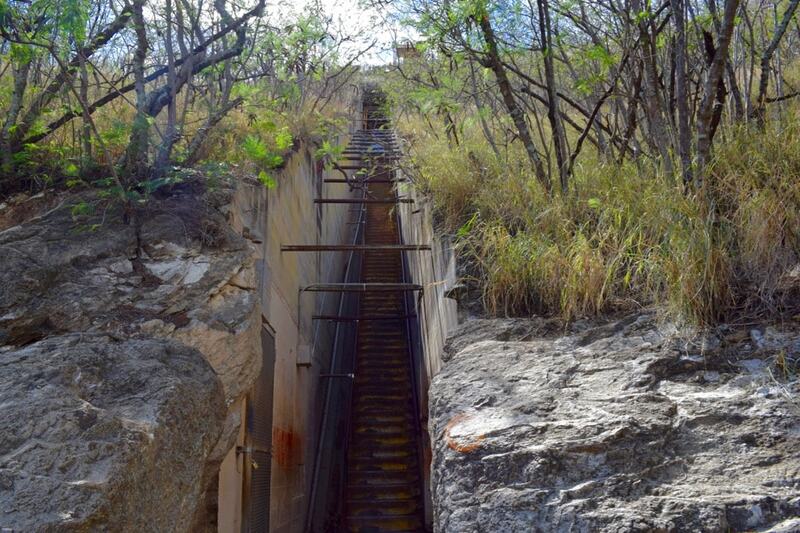 Finally, to reach the summit there is another set of narrow stairs then you clamber out through a gap in the bunker to an open path with incredible sea views. 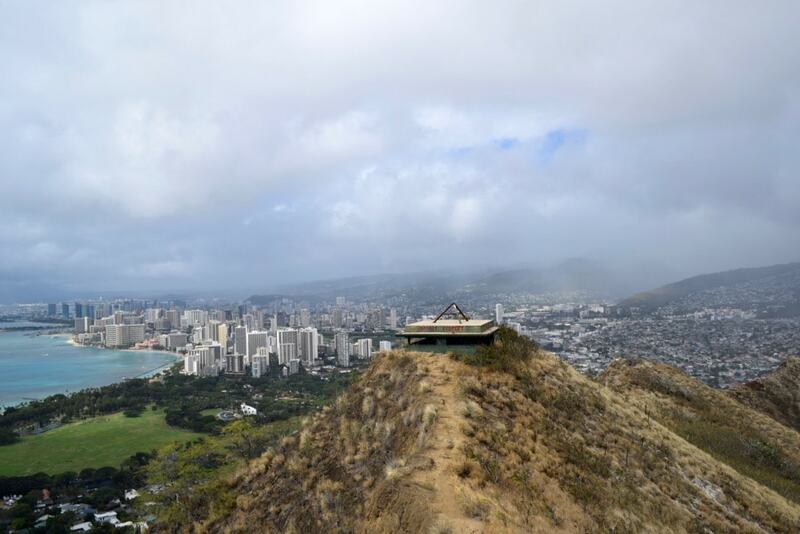 From there you can reach the highest point by taking one more set of stairs for the best panoramic views of Honolulu. 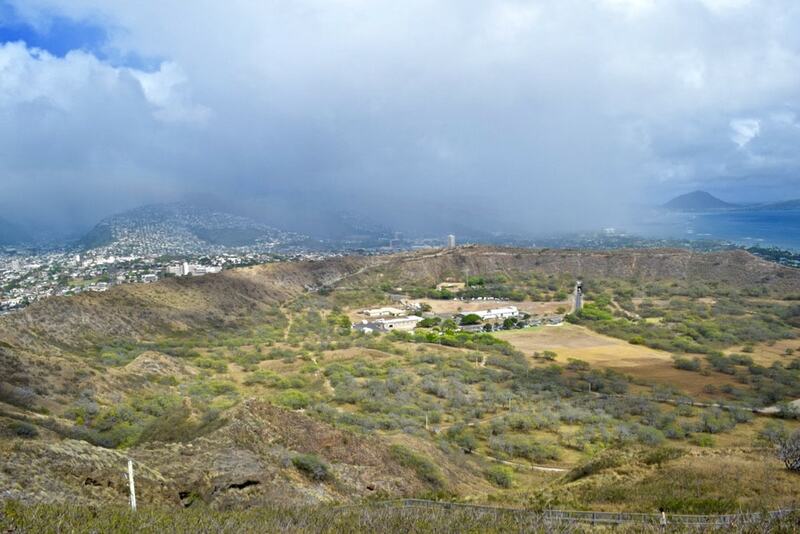 I found the Diamond Head crater hike tiring as it was pretty warm and the terrain was steep. Once at the top, the weather changed and we had a patch of rain which made the path slippery for our descent. Bring plenty of water, a few snacks and pack sunscreen. Dress in light, athletic clothing and be sure to wear closed toe shoes or trainers. 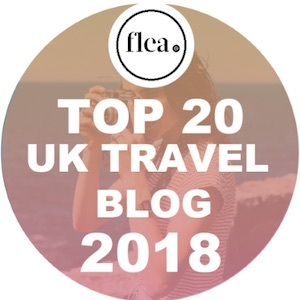 You could probably manage in sandals but they’re not ideal! A hat may be handy if the sun is out. Don’t attempt the hike with small children! We saw a few people with prams or carrying small kids. I’d just wait until they’re a bit older or it won’t be fun for any of you. Take it at your own pace. It’s not a race and the gradient is challenging, even for the fittest of people. Take lots of photos! The views really are stunning. The trail opens at 6am and closes at 6pm. Last entry is at 4.30pm. Entry costs $1 per person for pedestrians or you can take a car for $5. 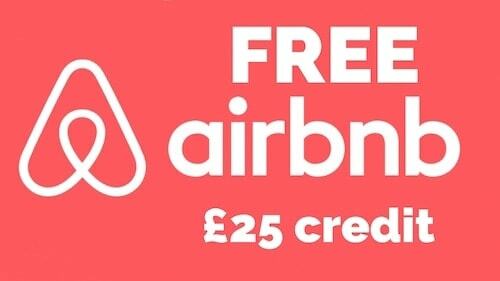 They only accept cash. Allow approximately one hour to get to the summit. 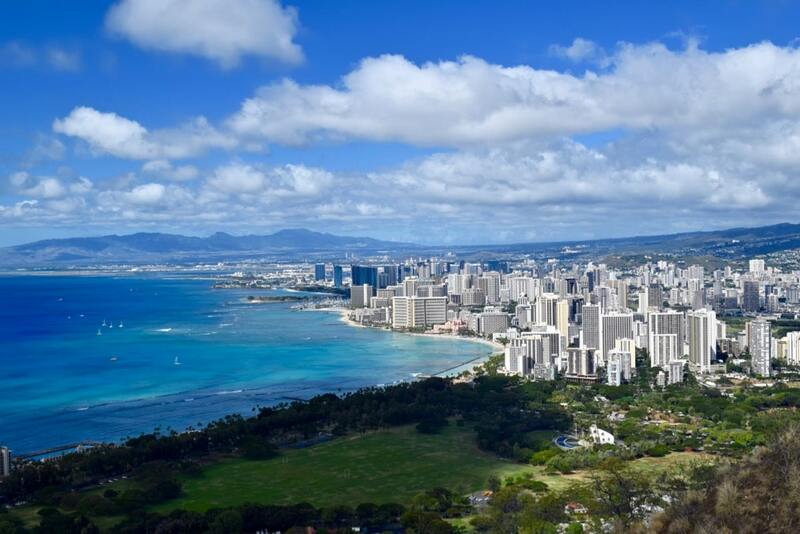 Here are my pick of the best Waikiki Beach hotels near Diamond Head, Hawaii. 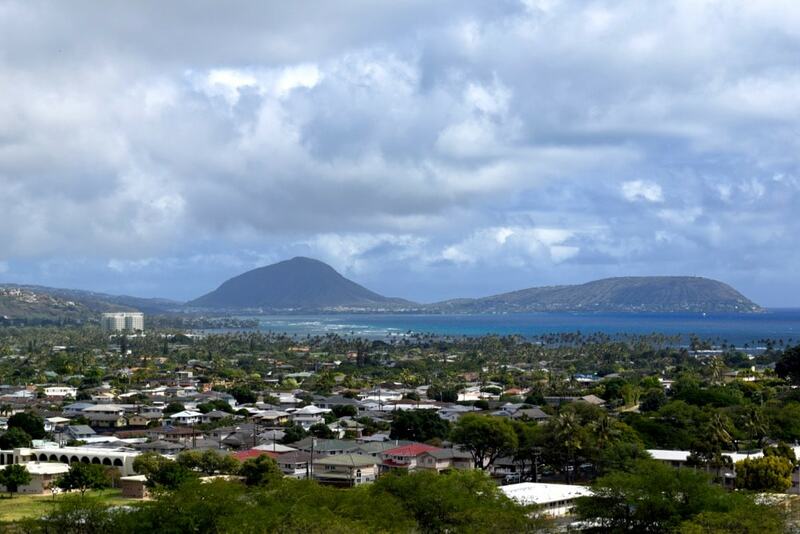 Waikiki Beach Marriott Resort & Spa – Smart 4-star hotel on the beach, with incredible views of Diamond Head. 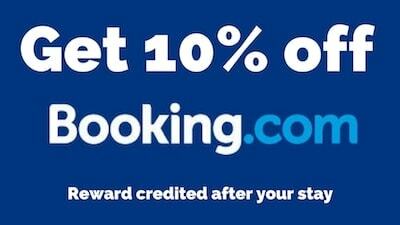 Featuring 5 restaurants, 2 outdoor pools and a top spa, it’s a fab place to relax on holiday. 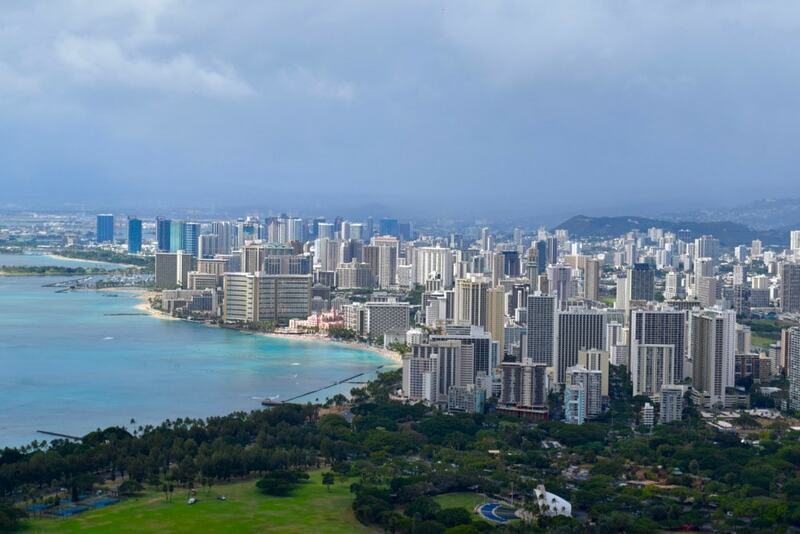 Outrigger Waikiki Beach Resort – Moments from the white sand of Waikiki Beach, this top hotel has an oceanfront swimming pool and sun terrace and several restaurants, including a highly regarded steak house. The Residences at Waikiki Beach Tower – One of the most luxurious places to stay in Waikiki, this hotel is 2 minutes away from the beach. It’s an all-suite property, with huge terraces overlooking the ocean, pools, hot tubs and even a BBQ area. 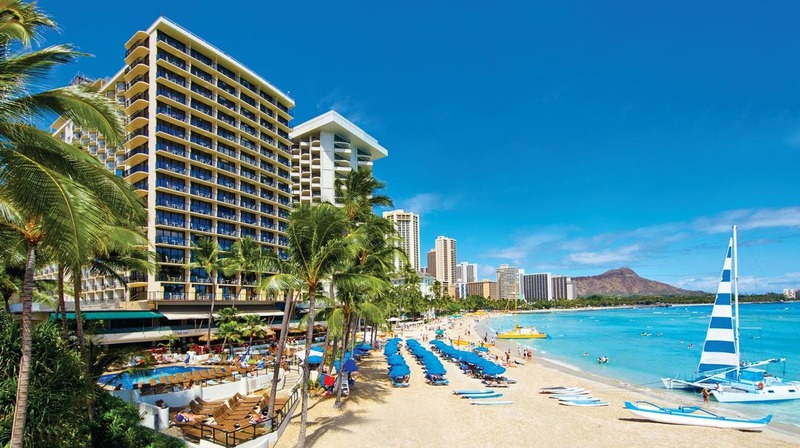 Hyatt Regency Waikiki Resort & Spa – This is where I stayed during my time in Honolulu. 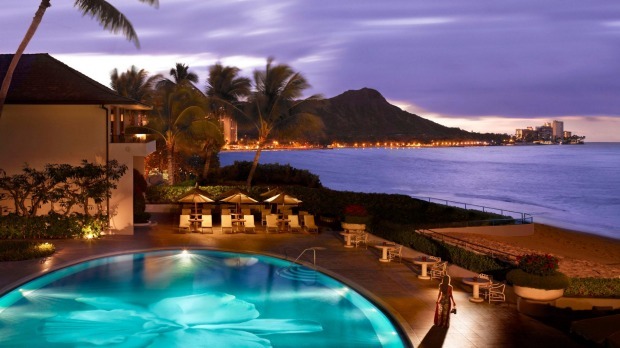 Moments from Waikiki Beach, this is a smart hotel with a great pool area (including hot tub!) a restaurant serving top breakfasts, and a bar serving cocktails. It was a great base for our trip. 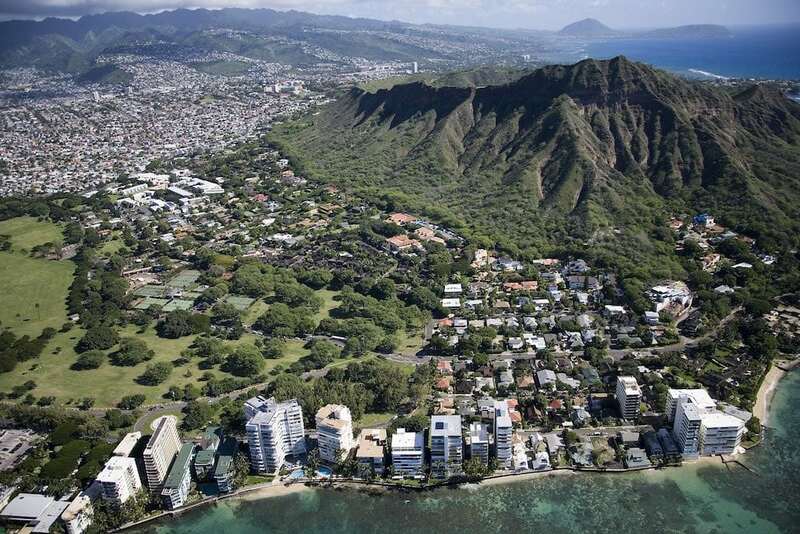 Halekulani Hotel – Overlooking Diamond Head, moments from Waikiki Beach, this beautiful hotel has 3 restaurants, a spa and live jazz. 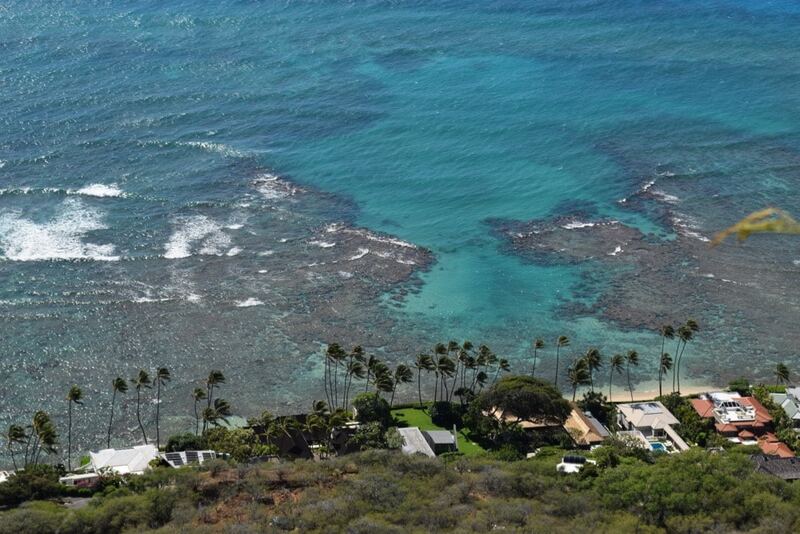 You can relax by the pool and take in views of the ocean and Diamond Head, which is pretty special! Incredible views!! 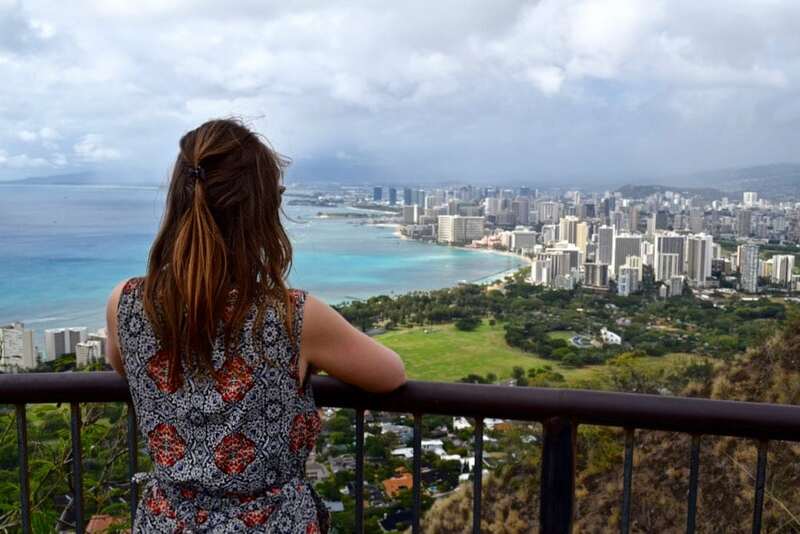 I want to visit Hawaii even more now! It was sooo beautiful. Worth the leg burn that’s for sure! 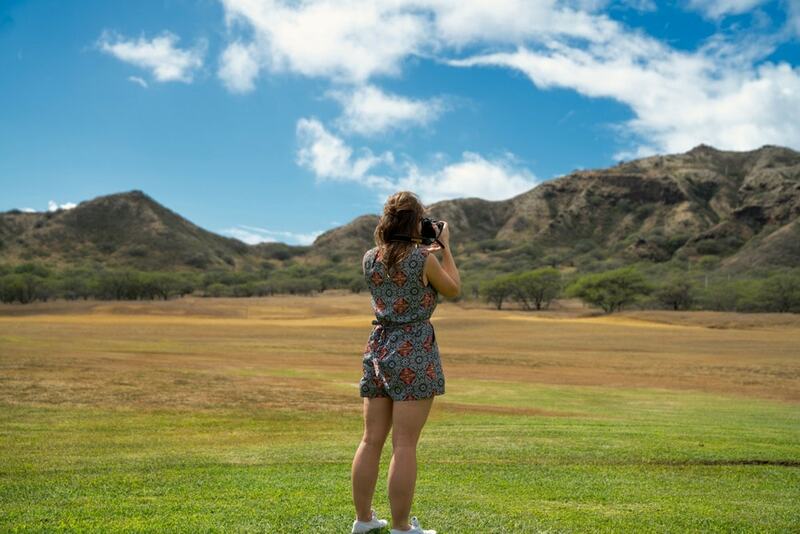 Girl your pictures are simply stunning – I’d LOVE to visit Hawaii, it’s been on my bucket list for so long (even more so now I’ve read this post). P.s not sure if I’ve said but I’m really loving your new design girl!